The yellow anaconda is the smaller “sibling” to the elusive green anaconda. The color pattern of Eunectes notaeus consists of a yellow, golden-tan or greenish-yellow ground color overlaid with a series of black or dark brown saddles, blotches, spots and streaks. Green and yellow anacondas are the only two species of anaconda known to be commonly kept in private collections. Eunectes notaeus is a very rewarding species to keep. Starting off, neonate Eunectes notaeus can be kept in 6-12 qt tubs or an equivalent size enclosure. You don’t want to start off with something too large as you want to monitor your neonates with ease and make sure that they are provided with the correct environmental variables. Glass aquariums are NOT recomended for anacondas as they are typically intended for fish, not large constrictors. They do not hold in heat or humidity well and are often very heavy compared to much better caging options. For larger juveniles and adult Eunectes notaeus you should house them in custom PVC or wooden snake cages. Be sure to have ample ventilation to avoid mold growth, due to keeping such high humidity. Average sized adult Eunectes notaeus do best in a cage of 2.4 x 1.2 x 1.2 meters (8 x 4 x 4 feet) of land space. The more room, the merrier as long as you can provide proper heat and humidity level. The cage size may vary if you have an abnormally large or small anaconda. You can always decorate your enclosure with well fitted logs and foliage in order to create a more naturalistic approach. A hide box is used to help a snake feel more secure and hidden. Many young Eunectes notaeus will utilize places to hide. It’s always a good practice to offer a hide on both ends of the enclosure and let your snake decide which one it will use. They tend not to use them as often as they grow larger in size but you can still offer hides throughout the snake’s life. The size of the hide box should be just big enough to allow the snake to fit snug inside. This makes them feel as though they are hidden from predators and is vital for some snakes to feel comfortable and not cause any issues such as stress, which leads to some snakes not wanting to eat. There are several options for substrate that can be used. I personally use both Kraft paper for neonate and juveniles and Reptichip coco fiber bedding for yearlings and adults. When using loose substrate, 0.07-0.1 meters (3-4 inches) of depth or more is sufficient to allow burrowing and the ability to spot clean. Coco fiber holds humidity extremely well and is very absorbent. Aspen bedding is another common substrate used for snakes but is not recommended for anacondas as it tends to be better suited for drier environments. Cedar and Pine shavings should be avoided as they are toxic to reptiles. Eunectes notaeus do best under natural day and night cycles. Full spectrum lighting (UV to infrared) should be added to the enclosure in order to provide natural lighting to your snake but it is not recommended to be left on for extended periods of time. Snake can and will bask. You should keep a schedule of 12 hours day and 12 hours night or even better adjust the lighting period according to the season. There are a few different options for heating but your end goal is to achieve a hot-spot of 31-33°C (88-92°F) with a cool end of 25-27°C (78-80°F) on the other side of the enclosure for the snake to cool. I use a heat pad under one side of the enclosure for my neonate enclosures to provide the snake with “belly heat” which will also require a quality thermostat to ensure that the heat pad does not get too hot or too cool. 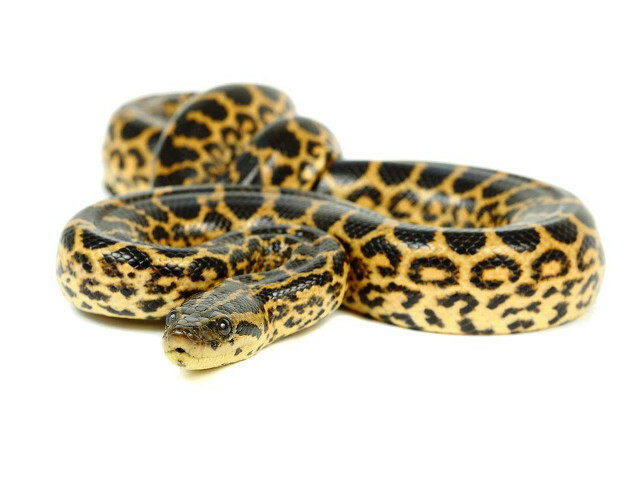 Without a thermostat, many heat pads will continue to heat up to the point of burning the enclosure and possibly starting a fire and injuring your snake. For my adult enclosures I recommend radiant heat panels. Heat pads won’t be able to work because I offer my snakes a deep substrate and the heat pad warmth won’t pass through. The radiant heat panels are mounted on ceiling of the enclosure and the provide a more natural type of heating. Heat should come from above at the proper wavelengths. Ceramic heat emitters or heat bulbs can also be used but ensure that the enclosure is still retaining adequate humidity as heat bulbs tend to dry enclosures out. Eunectes notaeus are a semi-aquatic species of snake so they require a water source large enough to fully submerge in. Anacondas will typically spend a large majority of their time in the water as much of their time in the wild is spent swimming through swamps and rivers. The water source should be cleaned and changed out every few days to avoid any health issues. Anacondas will often defecate in their water as well so be sure to clean the water immediately when this occurs. Anacondas have high humidity requirements and this can be achieved with regular misting or usually just by having a large water source. Coco fiber bedding comes in handy here also, as it absorbs and holds moisture, which will raise humidity levels. If you live in a dry region, you may have to mist more often than someone living in a more humid region. You can also move the water source closer to the heat source to raise humidity. A good humidity range for Eunectes notaeus is between 60-70%. That is the average humidity range in their natural habitat. It’s not uncommon to see condensation on the walls or ceiling of the enclosure. Be sure to have adequate ventilation as well so that the enclosure does not become muggy and constantly damp. This can lead to health issues which will be addressed later. Neonate Eunectes notaeus will typically start their lives by eating birds such as small quail or chicks, although the preferred diet is a variety of prey such as birds, fish, rodents, and other small mammals. Usually they can be switched to rodents after a few feedings. Some less picky anacondas may start off eating live or frozen thawed (f/t) rodents right away. It is best to offer f/t prey but some snakes will start off only eating live prey. It is important to get your anaconda eating f/t prey as soon as possible because some live prey have the potential to seriously injure or even kill your snake. If live feeding is your only option, be sure to supervise the entire feeding and intervene if necessary. Large live prey such as rats or rabbits can inflict a serious bite or cut to a constricting snake. As adults, Eunectes notaeus will normally take large adult rats, guinea pigs, or rabbits as their staple diet. You can also still offer birds and even some types of fish to adult Eunectes notaeus to add some variation to their diet.Neonate Eunectes notaeus are fed once every 7 days, with juveniles being fed about every 10-14 days. Adult yellow anacondas can be fed an appropriately sized meal once every two-four weeks depending on the size of the meal. If it is a very large meal they can certainly go longer between feedings. One of the biggest rumors surrounding Eunectes notaeus is their reputation for being very defensive. This is somewhat true, but not completely. When these snakes are born, they are often quite defensive as this is a stage in their life where many of them would fall prey to a predator in the wild. With regular handling they tend to get much more tolerable of human contact. Snake hooks are normally used to assist in maneuvering defensive snakes but are not recommended with these snakes as adults as they are heavy bodied snakes and all of that weight on a thin hook could easily break their ribs. It is best to carefully use your hands and be gentle. Some of my anacondas have stayed defensive but most of them are fine to be handled as they are accustomed to it. In fact, one of my adult female Eunectes notaeus is probably the calmest and friendliest snake I own, out of dozens of different species. Cleaning largely depends on when the snake defecates or urinates. This is typically weekly for most snakes so you should be cleaning the enclosure often to avoid any bacteria growth. If you use substrate such as coco fiber, often times you are able to spot clean the area and just fill it in with new substrate. Substrate should be fully replaced every few weeks and a thorough cleaning of the entire enclosure is necessary. These snakes typically do not have many issues with shedding as their humidity should be kept higher than most snakes and they should have a constant large water source to soak in. Younger anacondas shed every few weeks and their shedding slows down as they age. Adults may only shed every few months. A snake fed more heavily would typically shed more than a snake fed less often, as that snake would be growing faster. If there does happen to be a problem with stuck shed, simply up the humidity and take the snake out and put it in a container/tub to soak for 30 minutes to an hour if it will not soak on its own. The shed should come right off during or after the soak. If not, continue the sessions of soaking for the following few days. Just be sure not to pull the shed off if it does not very easily come off as this may result in tearing of the skin or pulling off scales. The most common health problem in snakes is upper respiratory infection (URI). This can be caused by many factors and can potentially lead to death if left untreated. URI’s are commonly caused by inconsistent heat, leading to the snake being too cold. Inconsistent/incorrect humidity can also cause a URI. The best cure for a URI is to ensure all of the care requirements are being met and seek Veterinarian assistance immediately. These snakes are often susceptible to water blisters. This can happen if a snake soaks in water that is unsanitary or the snake is living in unsanitary conditions. This can often be avoided or corrected by keeping the enclosure and water source clean and cleaning the snake’s enclosure after it defecates/urinates. A vet visit is recommended to avoid infection and further issues if the problem doesn’t quickly clear up. Another common issue is snake mites. Snake mites are very similar to ticks that humans can attract, or fleas on animals. They crawl all over the snake’s body, in cavities on the face, and under the scales. They feast on the snake’s blood and can easily transfer disease from one reptile to another. This causes an immense amount of stress to a snake and can cause many more issues. They can be a huge problem if you do not quarantine new animals away from your current animals and can spread to other snakes in just minutes or hours. There are numerous ways to treat mites and my personal choice is to use a product called Provent-a-mite. It is an aerosol spray that is used on the substrate in the enclosure. The main ingredient, permethrin, kills mites on contact, dry or wet. It is lethal to snakes when wet so you must ensure it is COMPLETELY dry before introducing the snake back into the enclosure and be sure to remove the water dish when spraying. I put the infected snakes on white paper towels as substrate since mites are black in color, and you will be able to see the mites that have died. You simply repeat this step for a couple of weeks and the mites will disappear. This product should also be used as a preventative in the future to ensure no mites enter your snake collection.